Saturday, Aug. 11 • 11 a.m. – 7 p.m. The Latino Cultural District’s bimonthly art stroll returns to the Mission with a whole new lineup of free family-friendly arts programming. This month’s Paseo Artistico aims to raise awareness about children and their families separated at the U.S.-Mexico border, as well as highlight the value of children in our local community. 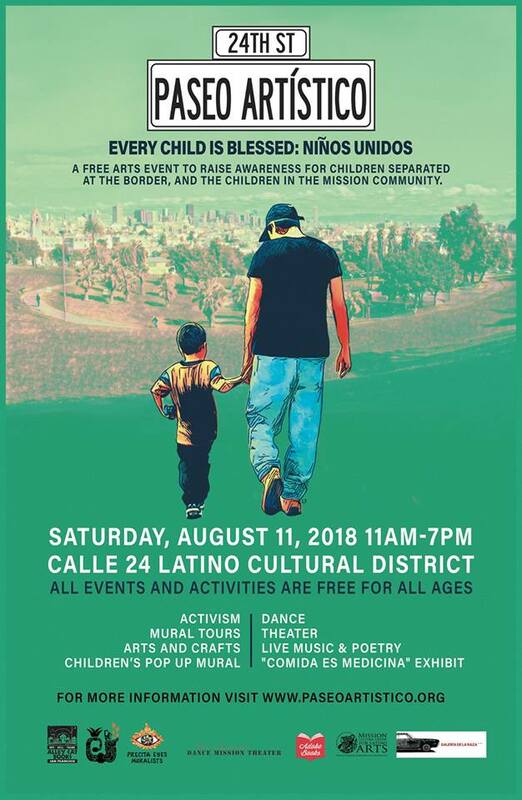 Live music and dance from Latino, indigenous, hip-hop, and tropical artists, poetry and literary arts from Central American authors and writers, as well as indigenous food demonstration, interactive arts and crafts workshops for all ages will be presented for free to the entire community. For full schedule of events please join the Facebook event page or visit the Paseo Artistico website.